Busy Buddy Bouncy Bone is a chewing bouncing interactive toy for dogs who love to chew and chew. 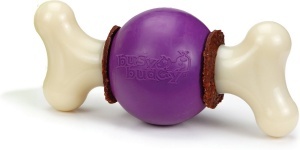 Includes three rawhide treat rings for extended chewing fun. The rings can be replaced when worn out. Large or Extra Large sizes for big dogs.